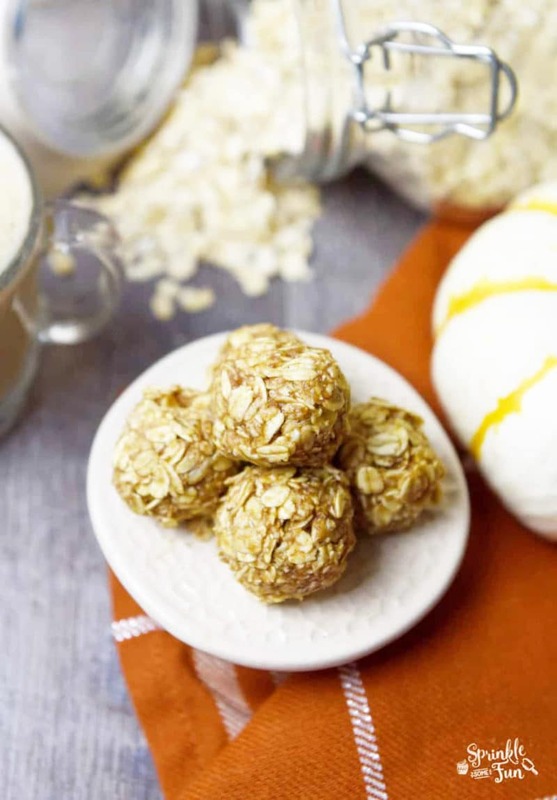 Delicious Pumpkin Spice Energy Bites have just three ingredients and are so easy to make! These are great to have on hand for after school snacks or anytime you need a pick me up. This is a sponsored conversation written by me on behalf of International Delight. The opinions and text are all mine. It’s a few days away from officially being fall. I love the fall weather, cozy sweaters, fall leaves and of course pumpkin spice! Now that it’s fall I have get up earlier than I do in the summer. I’ve always thought it would be neat to be a morning person and I often dream about what it could be like. I would get up early and have the house all to myself for an hour or so. I might even have enough time to get a few chores in before the kids wake up. It’s nice to think about, but not a current reality for me! I am a stereotypical night owl. I’m groggy until I have some coffee and I rarely cook anything until later in the day. This is why I’ve always relied on having easy to prepare recipes like these Pumpkin Pie Energy Bites. I make these ahead of time and they are ready to eat after spending the night in the refrigerator. For the fall, these Pumpkin Pie Spice Energy Bites are a great breakfast option because of the yummy Pumpkin Pie Spice flavor. 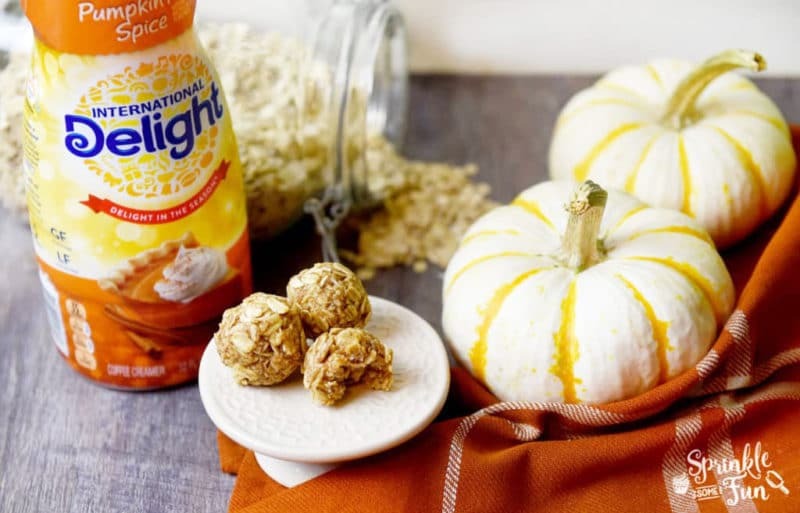 To get the Pumpkin Pie Spice flavor into these energy bites I used International Delight Pumpkin Pie Spice Creamer. I love to eat them with either International Delight Pumpkin Pie Spice Creamer in my hot coffee or iced coffee. The Pumpkin Pie Spice in iced coffee is great for the weather we are having right now which is still pretty warm. 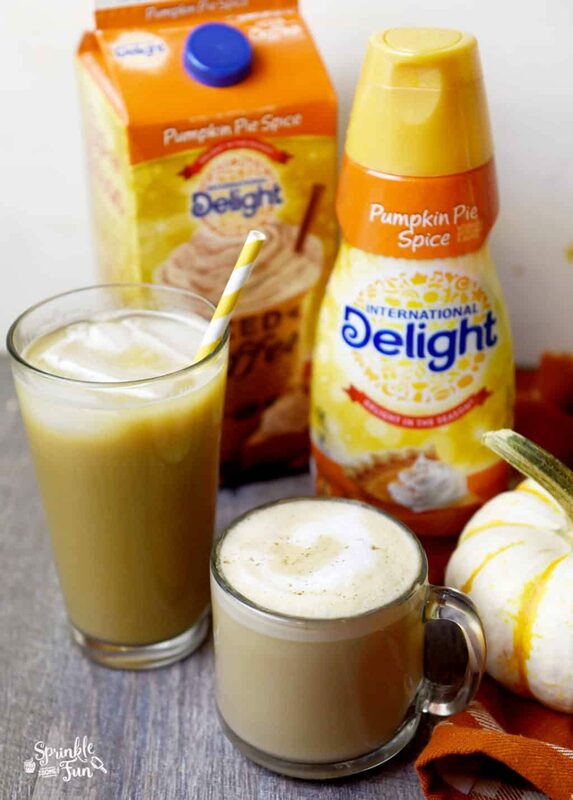 Do you love Pumpkin Spice at this time of year? I know not everyone does and so these can be made with pretty much any creamer! 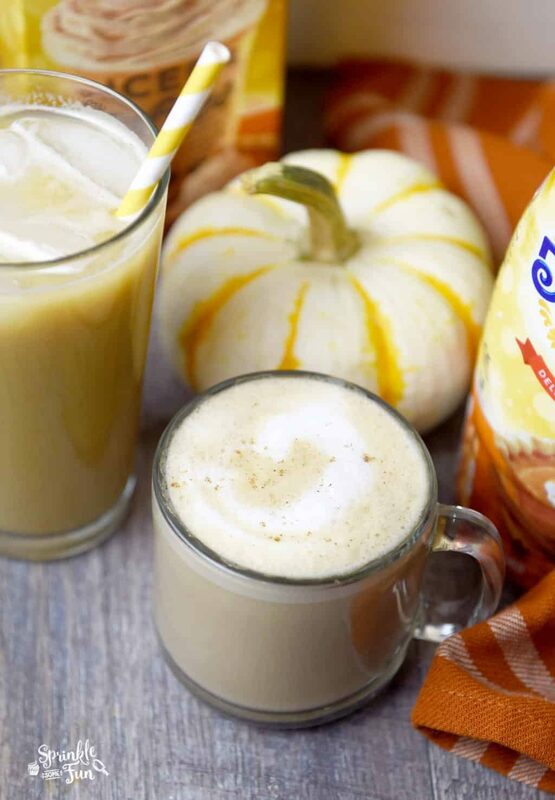 Pumpkin Spice creamer adds so much flavor and sweetness all in one. I know I’ll be making these a lot this season and be using some of the suggestions that I’ve made below. Raisins. My kids love raisins… me not so much! I love that they love them, though and they would taste great in these for the raisin lover. Dried Cranberries. Same as the raisins they will give a nice sweet and fruity punch to the energy bites. Chopped Nuts. Add a 1/4 cup of your favorite chopped nuts in this. Almonds, pecans and walnuts would all be a great choice. Add more pumpkin flavor. I think the pumpkin bites are great as they are, but you may want a bit more spice. Add more pumpkin flavor by adding a Tbsp. of real pureed pumpkin and 1/4 tsp. pumpkin spice to the mixture. This will really boost that yummy pumpkin taste we all know and love. Pumpkin Spice Energy Bites are so good and filling for such a light snack! 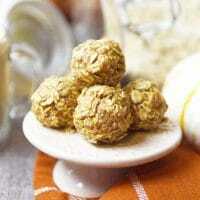 I always love how oatmeal fills me up and these are so easy to grab when I need a light snack. 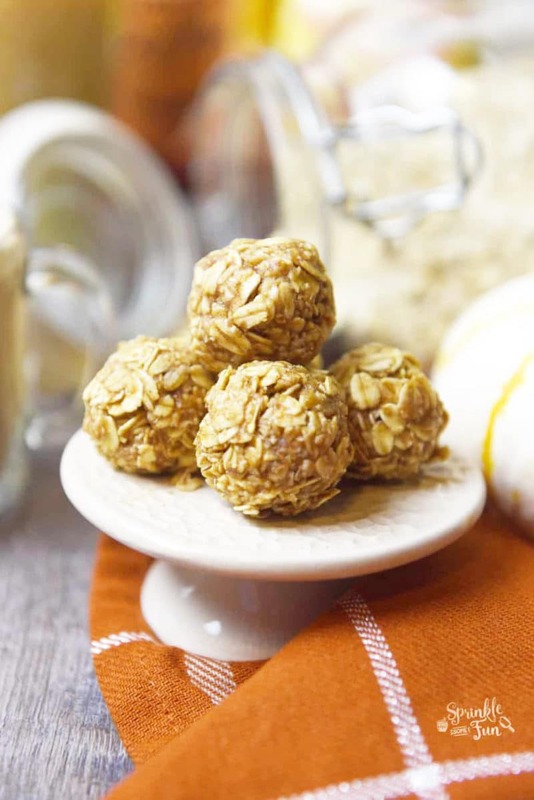 Make Pumpkin Spice Energy Bites ahead of time for a tasty snack anytime of the day. Pumpkin Spice Energy bites are great at snack time, breakfast or anytime you need a little pick me up. Mix all ingredients together in a medium sized bowl and them form the mixture into 5 small balls. Eat them right away or store in the refrigerator overnight.